The San Bernardino Police Department is a strong and proud organization that relies heavily on the experiences of its tenured members. However, as time goes by, more and more members of our department are retiring and, sadly, passing on, and taking these memories and experiences with them. 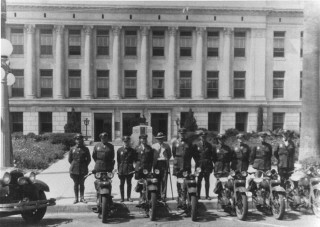 The San Bernardino Police Historical Society was formed with the primary mission of collecting and preserving these memories so that current and future members can enjoy them and see where we, as a department, evolved from. As chairman, I have the pleasure of receiving these items and communicating with the donors about their history. Along with that the Historical Society also sponsors the Career Achievement Award, presented to a member of the department each year and the annual awards ceremony. When I was told that the Historical Society would have a place in the new website, I was honored and welcomed the opportunity to reach out to all of you to assist us with our mission. We are constantly seeking help from members of our organization (both active and retired) as well as citizens who may have items of historical interest, such as uniforms, patches, badges, photographs or other interesting artifacts that they would be willing to donate. Our goal is to archive as many items as possible and to display these items for everyone to enjoy and, as the website evolves, the Historical Society will contribute articles and other features to bring some of our department’s history to you to enjoy. If you have any items that you believe would be of interest to us, please contact me at the police department at (909) 384-5742, or contact us at the POA office and we will make arrangements for the items to either be dropped off or have someone pick them up from you. Once again, thank you for supporting our goal of keeping the tradition and memories of your police department alive. By 1850 California had won independence from Mexico in the Mexican-American War and had been admitted as a state into the union. In 1851 a company of 500 Mormon men, women and children with 150 wagons arrived in the San Bernardino valley. By February of 1852, the Mormon pioneers purchased the 40,000-acre San Bernardino Rancho from the Lugo family for $77,000. The Mormons built a stockade to protect themselves from raiding desert Indians, naming their stockade Fort San Bernardino. As the population increased to 1,200 people, so did the need for law enforcement, and in 1853 the president of the Mormon Church, Brigham Young, appointed Bud Rollins the first law officer in the San Bernardino settlement. By 1854 San Bernardino was thriving, and the city of San Bernardino was officially incorporated. With the vast majority of San Bernardino being Mormons, San Bernardino was a temperance town, with no drinking or gambling allowed. San Bernardino as an official Mormon settlement lasted only five years — in 1857, Brigham Young recalled the colonists, and many returned to Salt Lake. Opportunists of all kinds soon filled the vacuum that was created by so many leaving so quickly, and San Bernardino soon found a reputation as a tough town. In 1868 the elective office of town marshal was established. 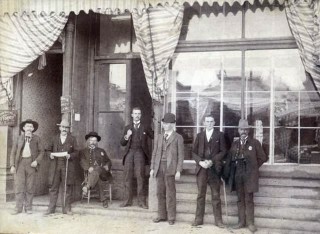 The town marshal would remain the law enforcement agency in San Bernardino until the town was reincorporated under the newly established rules of city incorporation in 1905. 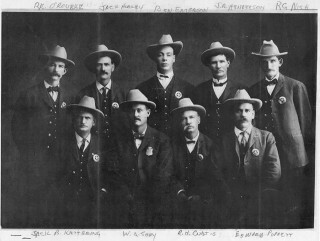 From 1853 to 1905, 15 men served as town marshal of San Bernardino: Bud Rollins, Stewart Wall, George Mattheson , Frank Kerfoot, Charles Landers, Mark Thomas, John C. Ralphs, L. Van Dorin, Joseph Bright, Hughes Thomas, David Wixom, William Reeves, John Henderson, Ben Souther and Walter A. Shay. After the City of San Bernardino incorporated under the new rules of incorporation, a mayor and city council were elected to office. 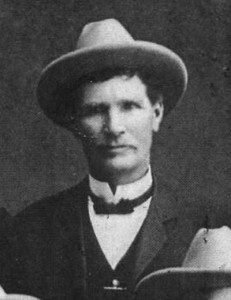 H.M. Barton was elected as the first Mayor of San Bernardino, and he and the new council took office May 8, 1905. 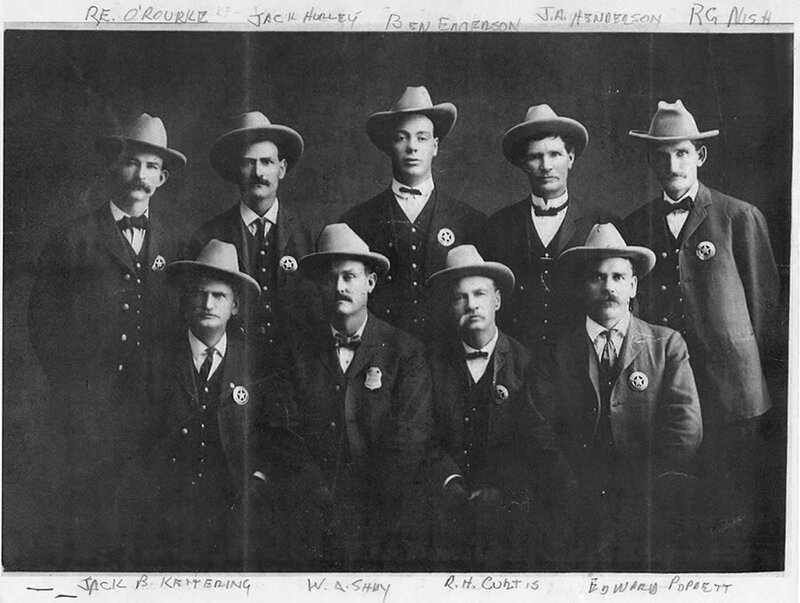 One of the first orders of business for the new mayor and council was to appoint a new police force to take office at 12 noon, May 15, 1905. 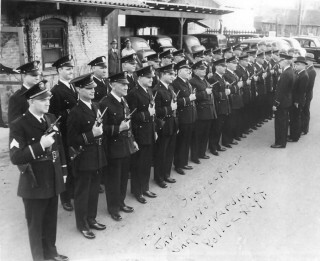 Mayor Barton read a proclamation naming the eight officers to the newly formed police department: John Bell Ketring, Robert O’Rourke, John A. Henderson, William H. Hurley, Edward Poppett, Benjamin Emerson, Richard Curtis and Robert Nish. 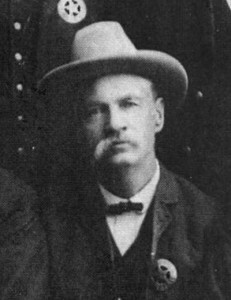 At the time that Mayor Barton and the councilmen were appointing the city’s new police force, Walter A. Shay still had approximately two years left on his elected position as San Bernardino town marshal. The mayor and council would have to wait until Shay’s term expired before they could appoint him the city’s first full-time chief of police. Walter Shay was born on June 29, 1866, in San Bernardino. In 1892 he married Matilda “Tille” McCoy-Shay and they lived at 495 N. “C” Street. After trying his hand at farming, Mr. Shay began his law enforcement career as a San Bernardino County deputy sheriff in 1899. In 1903 he was elected to a term as city marshall for the City of San Bernardino, a position he held until being named chief of police. W.A. 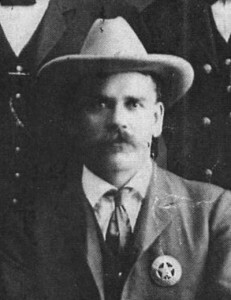 Shay went on to be appointed as chief of police by three different mayors between 1905 and 1917. 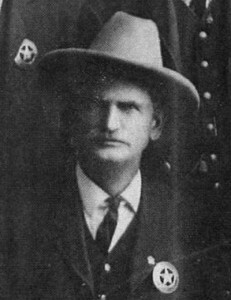 In 1918 Shay ran for and was elected San Bernardino County sheriff, where he served until 1931 when he was succeeded by his nephew Ernest Shay, who in turn was succeeded by Walter’s son, Emmett, in 1934. Chief Shay died on August 2, 1931 and is buried at San Bernardino’s Pioneer Cemetery next to his wife, Tille. Richard Holman Curtis was born in 1843 in Kentucky. In 1851 his parents brought their family to San Bernardino by oxen team, when he was only seven years old. 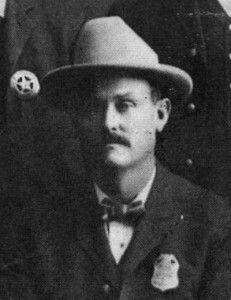 In 1905 Mr. Curtis was one of the original members of the current San Bernardino Police Department, where he was appointed the department’s first assistant chief of police. After being with the department for several years, Assistant Chief Curtis retired and became a school teacher and truant officer for the local school district and spent his summers in the Lytle Creek Recreation Area as a fire warden. Mr. Curtis died in 1924 at 81 years of age. He is buried next to Mrs. Curtis in San Bernardino’s Pioneer Cemetery. 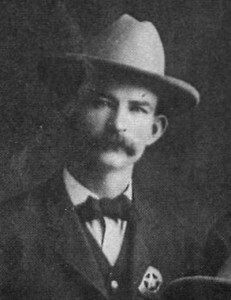 John Ketring was born in Linden, Tennessee, in 1860, and came to San Bernardino via Tombstone, Arizona, in 1882. In 1886 Mr. Ketring married Clara Campbell-Ketring, and they made their home at 1142 W. 7th Street in San Bernardino, where they raised two children. On February 3, 1905, Clara died, and Mr. Ketring went on to marry his second wife, Mina Gunn-Ketring, with whom he had a daughter. Prior to becoming one of the original members of the current San Bernardino Police Department, Officer Ketring operated a grocery store at 555 W. 3rd Street, with fellow future San Bernardino Policeman and Mayor John Henderson. 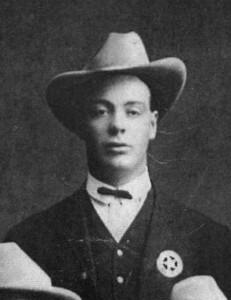 In 1905 Mr. Ketring became a member of the San Bernardino Police Department, where he remained as an officer for several years. Officer Ketring died on April 2, 1947, and is buried at San Bernardino’s Pioneer Cemetery. According to Lewis Ketring Jr., John Bell Ketring arrived in San Bernardino in early 1882. Lewis remembers as a child that his great-grandfather was very evasive about his life after leaving Linden, Tennessee, and prior to arriving in San Bernardino. Lewis says that John Bell was “mysterious and evasive.” When asked about his early years, he would become very defensive and say that that was another life and another place and change the subject. Lewis researched information that places John Bell in Arizona prior to arriving in San Bernardino in 1882. He found that when John Bell Ketring arrived in San Bernardino, he lived in Nicholas and Virginia Earp’s boarding house. Lewis has a suspicion that John Bell may have known the Earp brothers in Tombstone, and that when Morgan Earp was killed, he (John Bell) assisted Virgil and James Earp in the transportation of Morgan’s body to San Bernardino for burial in Colton. That would explain his acceptance into the boarding house and possibly an introduction to Walter Shay by the Earps and his subsequent employment as a San Bernardino policeman. 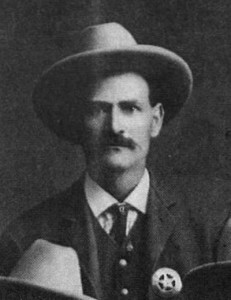 Lewis also believes that after leaving Linden, John Bell may have assumed an alias (“Turkey Creek Jack Johnson”) and used that alias while living in the New Mexico and Arizona area. John Bell’s father was Frances Johnson Ketring, and Lewis feels that this is too much of a coincidence. Edward Poppett was born on July 30, 1869, on the family farm on the southeast corner of Baseline Street and “D” Street in San Bernardino. His family was one of the original founding families of San Bernardino. In 1889 he was married to Mary Poppett and they moved to 1284 N. “D” Street. Mr. Poppett began his career in law enforcement by being a deputy city marshal (policeman) for several years in San Bernardino prior to the formal incorporation. In 1905 he was naturally chosen to be one of the original nine officers of the current San Bernardino Police Department and continued his career by becoming the department’s first detective. Detective Poppett retired from the police department in 1952, after serving for 47 years, a record that still stands until today for a full-time employee. Detective Poppett died on September 11, 1961, at the age of 92 and is buried at San Bernardino’s Mountain View Cemetery, next to his wife, Mary. James Alexander Henderson was born on May 29, 1856, in St. Louis Missouri. When he was a small child, his father died and his mother migrated to San Bernardino with her children, where she became the second wife of a local Mormon businessman. Mr. Henderson married Asenia Ferrel Wilson and lived for many years at 805 N. Mount Vernon Avenue in San Bernardino. Mr. Henderson came from a large family, with many siblings; however there is no record of him and Mrs. Henderson ever having any children of their own. In the late 1800s Mr. Henderson was elected to three terms as the San Bernardino city marshall. After completing his third term, he went into the grocery business with future San Bernardino Policeman John Ketring, where they had a small market located at 555 W. 3rd Street. 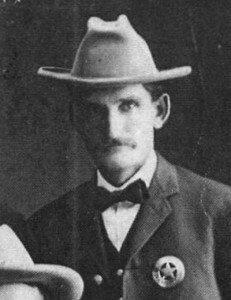 In 1905 Mr. Henderson became one of first officers of the current San Bernardino Police Department. 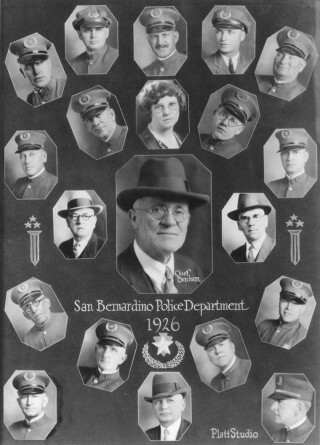 After serving with the San Bernardino Police Department for many years, Mr. Henderson went into politics, and in 1919 he was elected to a term as San Bernardino city mayor. Officer Henderson died in March 1938 at the age of 81 and is buried in San Bernardino’s Pioneer Cemetery, next to Mrs. Henderson. Robert Nish was born in San Bernardino on January 30, 1862. On June 4, 1890, Mr. Nish married Isabella Shelley-Nish and lived at 1268 W. 7th Street, where they raised two children. Mr. Nish began his law enforcement career as one of the original members of the San Bernardino Police force in 1905. In 1910 Officer Nish left the San Bernardino Police Department and went to work as a deputy sheriff for the San Bernardino County Sheriff’s Department until 1920, when he became a railroad car repairman with the Santa Fe Railroad. Mr. Nish’s family became distant to the San Bernardino Valley area and his only known relative is his granddaughter, Mrs. Shirley Smith of Buena Vista, Colorado. Officer Nish died on July 7, 1936, at Loma Linda hospital at the age of 74 after a long illness and is buried at Mountain View Cemetery. Robert O’Rourke was born on February 19, 1872, in San Simeon, California. In 1900 Mr. O’Rourke and Emma McCoy-O’Rourke (sister of Mrs. Walter Shay Jr.) were married, making their home at 981 N. “F” Street in San Bernardino. Robert and Emma O’Rourke had no children and in 1908, Emma passed away. That same year Officer O’Rourke left the San Bernardino Police Department, moved to Long Beach and joined the Long Beach Police Department, becoming that department’s first motor officer and rising to the rank of captain of detectives. While living in Long Beach, Officer O’Rourke married Mary Elizabeth Settles, with whom he had a daughter. In 1914 Officer O’Rourke left the Long Beach Police Department and moved to Santa Monica. After only serving at the Santa Monica Police Department as a detective for a short time, he was hired by the Pasadena Police Department as a detective, the only person to ever be hired by Pasadena with the entry level rank of detective. Mr. O’Rourke served the Pasadena Police Department for 20 years, retiring in 1941 at the rank of detective lieutenant. 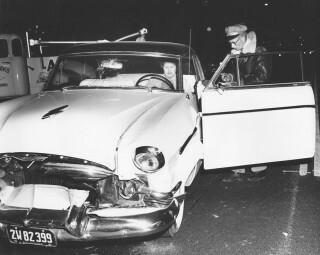 Officer O’Rourke died in Alhambra, California, of natural causes on December 6, 1941, at the age of 68 and is buried in Mountain View Cemetery in Alta Loma. William “Hack” Hurley was born in Iowa on March 28, 1838, and came to San Bernardino in an oxen wagon via Utah in 1859. He was married to Serena Black-Hurley and they lived at 310 N. “H” Street in San Bernardino. 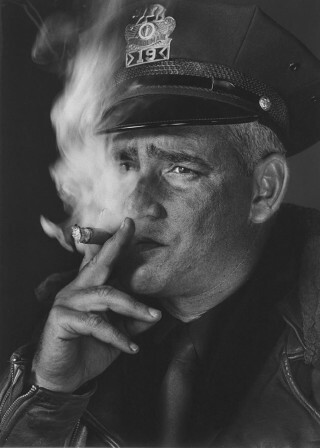 Following his retirement from the police department, Officer Hurley became a rancher and lived in the area of Los Angeles County now known as the San Fernando Valley, before traveling throughout the state. Through research it was discovered that Benjamin Emerson was born in 1880 in San Bernardino and lived at 426 W. 3rd Street with his wife. Other then being one of the original nine officers of the current San Bernardino Police Department, not much is known about Benjamin Emerson. In 1908 Benjamin Emerson left the police force to pursue a career in sports and moved to 653 W. 3rd Street. On October 14, 1914, Benjamin Emerson died after he became involved in a fight with a local newspaperman who pulled a handgun from his pocket and shot Emerson in the chest. Ironically, Mr. Emerson died in the back of a police patrol wagon while being taken to County Hospital. Benjamin Emerson is buried in Mountain View Cemetery in San Bernardino.